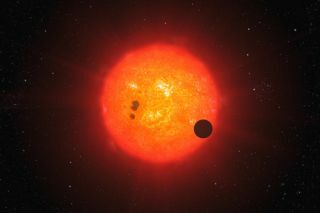 An artist's impression of an exoplanet transiting a red dwarf star in the same way as the newfound, Earth-size exoplanet GJ 1132b does. There are nearly 2,000 exoplanets on the books, and much is known about them, at least in broad strokes, such as their sizes, masses and distances from Earth. Yet the details that give these celestial bodies their individuality — weather, winds, air, and even the colors of their skies — remain scant. This is particularly true for the growing number of small, Earth-size exoplanets, from which astronomers hope to glean clues about life's potential genesis elsewhere in the universe. Now a newfound exoplanet announced in the journal Nature, and discovered by a member of the Kavli Institute for Astrophysics and Space Research at the Massachusetts Institute of Technology (MIT), offers scientists one of the best chances to truly know an extraterrestrial planet. Called GJ 1132b, it crosses the face of a nearby red dwarf star only 40 light-years away. These so-called transits — mini-eclipses, really — have allowed researchers to gauge GJ 1132b's size as just 1.2 times that of Earth. Other measurements have revealed it boasts a similar density to our rocky planet. All told, GJ 1132b is the closest transiting, Earth-size, rocky planet ever spotted. Although too hot for life, given its tight obit, GJ 1132b's relatively large size compared to its small star nevertheless makes it an ideal planetary laboratory. It will likely be one of the first targets of the James Webb Space Telescope, Hubble's successor launching in 2018. The Webb will gather starlight streaming through the planet's atmosphere, bearing markers of its composition. GJ 1132b might thereby serve as a Rosetta Stone for future characterizations of small exoplanets. On October 28, 2015, The Kavli Foundation spoke with three astrophysicists about why the discovery of GJ 1132b could be crucial to the quest to understand worlds in other solar systems. Zachory Berta-Thompson — a exoplanetary researcher at MIT's Kavli Institute for Astrophysics and Space Research. Berta-Thompson is the lead author of the new Nature paper and is part of the MEarth Project, which monitors nearby red dwarfs for exoplanet transits and pinpointed GJ 1132b. Elisabeth Newton — is a co-author of the Nature paper, a member of the MEarth Project and a graduate student at the Harvard-Smithsonian Center for Astrophysics. Rory Barnes — is a research assistant professor in the Department of Astronomy and Astrobiology Program at the University of Washington. He is also member of NASA's Virtual Planetary Lab, which simulates exoplanetary environments to learn how we might remotely discern the presence of life through existing scientific instruments. The Kavli Foundation: What is uniquely important about the discovery of this new exoplanet, GJ 1132b? Elisabeth Newton: There are many exoplanet discoveries — I think we're probably approaching an average of one new exoplanet per day. But the majority of those planets orbit stars that are very far away and very large. Those two factors contribute to making it difficult to actually understand what the properties of a planet are. GJ 1132b is three times closer to us than any other Earth-sized planet we know of, and it orbits a small red dwarf star that is just one-fifth the size of the Sun. So that's one of the reasons why this discovery is unique. Rory Barnes: Because GJ 1132b is orbiting a star that's very different from the Sun, the planet is undergoing very different geophysical processes as it evolves. The planet will probably be one of our first opportunities to understand some of these processes happening on planets around red dwarfs. NASA has a plan to really focus on these small, red stars in the near future in the search for life. Red dwarfs are the most common type of star, making up something like 80 percent of all stars in the galaxy, and they are relatively dim and small, so their planets are easier to discern and study during transit events. But we don't know just how friendly to life these red stars might be. Zachory Berta-Thompson: That's right. To get a really complete picture of what exo-worlds are like, we need to focus on nearby, transiting planets, such as GJ 1132b. We can measure their sizes and their masses, their orbits and their atmospheres. It will be nice that we can ultimately do these tests sometime soon, even in the next five to ten years. R.B. : It's worth keeping in mind that when people like Zach and Elisabeth find these planets, they just look like a little dimming of starlight in a telescope — just these little black disks crossing in front a star. But finding a small planet like GJ 1132b around a nearby star is really exciting because it gives us an opportunity to start to learn about them. Everybody expects exoplanets to have a huge diversity of properties. When we look around our Solar System, we see an amazing myriad of worlds, but yet that can't be the full range. Exoplanets are going to be these really bizarre, strange new worlds, and that will teach us about what nature is capable of. TKF: Why is the proximity of exoplanets so important for being able to study them in detail? E.N. : The biggest factor is brightness. If you take a star that's like GJ 1132 and you put it 10 times further away, it's going to be a lot dimmer. That makes the detection of planets around it and all the follow-up studies of these planets 100 times harder, because of how the intensity of light diminishes over distance, just as a flashlight appears dimmer when it's farther away. Z.B-T.: Exactly. All the measurements that we make in astronomy pretty much boil down to counting the photons — particles of light — that we get from these stars or these planets. Every little bit farther away that you put a planet, the more difficult it is to detect those photons. R.B. : GJ 1132b is going to be fantastic once we actually measure its atmospheric properties. Anytime you have a chance to measure the atmospheric composition of an exoplanet you're going to learn a lot about how it formed and how it evolved. TKF: What might we expect GJ 1132b's atmosphere to be like? Z.B-T.: I'm really curious to hear what Rory has to say because as we wrote the paper, we talked about that. Our experience so far with exoplanets is that we're usually surprised when we finally get measurements. R.B. : I agree with you. The one thing we should expect with exoplanets is to be surprised! We can certainly make some crude guesses as to some of the most likely outcomes. For example, as Zach mentioned in the paper, there is the possibility of high oxygen levels in GJ 1132b's atmosphere. That results from the host star maybe being much brighter during the early stages of this planet's lifetime. The star could have blasted off a lot of the hydrogen that was present in water molecules in the atmosphere, leaving behind an atmosphere with a large oxygen component that might still be detectable today. TKF: Oxygen in its molecular form could be a sign of biological activity on a planet, in the presence of other gases such as methane. In a Kavli Hangout last year about the search for signs of life in exoplanets' atmospheres, Zach said: "In the next decade we are just barely getting to the edge of being able to detect something like molecular oxygen in a planet’s atmosphere," and with the "wind at our backs we may just be able to . . . find the right planet, meaning it's the right size and the right temperature, and around one of the very closest very small stars so it’s easy to observe.’ It sounds like GJ 1132b is what you were talking about, Zach? Z.B-T.: It's almost exactly what I was talking about. Even though GJ 1132b is just too gosh darn hot for life, it still gives us an opportunity to study the atmosphere of a rocky planet. R.B. : I agree 100 percent. There is no chance of life on this one, unfortunately. But it is exciting to be able to study the atmosphere of any rocky planet. For example, one of the most interesting things we can look for in the atmosphere of GJ 1132b would be signatures of volcanoes. GJ 1132b could be extremely volcanic. Detecting just a small amount of eccentricity, or deviation from perfect circularity, in the planet's orbit could turn it into something that I like to call a "super-Io." This would be like Jupiter's volcanic, "pizza-faced" moon Io, here in the Solar System, except a much larger body. It would be really exciting to be able to pin down a planet outside of our Solar System where we know volcanoes are erupting. Turning back to the possibility of oxygen and GJ 1132b, oxygen is a very reactive element, so it doesn't like to hang around in an atmosphere. But if you have enough oxygen, you can overwhelm all the different methods by which it gets removed. So it's certainly possible we could find oxygen on GJ 1132b and it would not be due to life by any stretch. The oxygen could result from an interesting aspect of its host star's evolution, which differs from what our Sun. Our Sun reached its current size relatively quickly, whereas red dwarfs can go through this very long period of being very big and bright. TKF: Elisabeth, your research focuses on nearby red dwarf stars, like GJ 1132. What do we know about the star and why is it important? E.N. : Without knowing the star's mass and radius, you actually have very little understanding of the size of its transiting planets. If our estimated radius for the star is off by 30 percent, then our estimated planet radius is also off by 30 percent — the measurements are linked. For this star, that means the single most important information we have is the star's distance from our Solar System. We have also measured how much light it emits. If we know a star's distance and how bright it appears, we can calculate how intrinsically luminous it is. The true brightness gives us a pretty good idea of the star's mass and radius. Another key property that comes immediately to mind is the star's "metallicity," or how much of its chemical composition consists of elements heavier than hydrogen and helium. Metallicity is important for knowing the amount of heavier elements that were present when the star's planets formed. For a small star like GJ 1132, we often obtain metallicity readings using a technique called near-infrared spectroscopy. As it so happened, I had gathered a near-infrared spectrum of the star about four years ago, when we had no idea it had a planet around it! E.N. : That spectrum told us that GJ 1132 is a bit less metal-rich than the Sun, but the cloud of gas and dust that formed GJ 1132 evidently had enough metals in it to form rocky bodies like GJ 1132b. Another important property is the star's age. We can get a sense of that from how long the star's rotation period is, and GJ 1132b has a long one — we measured it at 125 days. We therefore think GJ 1132 is fairly old, maybe around five billion to seven billion years. So, even on the low end, that means GJ 1132 is about as old as our Sun. If it has planets besides GJ 1132b that orbit farther out in its temperate, "habitable zone," in theory they would have had plenty of time to develop life, like here on Earth. TKF: Observations have revealed that red dwarf stars have more solar flare activity than our Sun. These flares expel vast torrents of energy and particles into space that irradiate nearby planets. Can GJ 1132b shed some light on the impact of these flares on planetary and potentially biological evolution? R.B. : We're at a pretty safe distance from our Sun. But the habitable zones for planets around red dwarfs are very close into their star. That makes the planets susceptible to the effects of the flaring and the activity of their host star, much more so than on Earth. The flaring can actually strip an atmosphere away and that, of course, is not good for life. You need an atmosphere to breathe and to keep temperatures somewhat pleasant. If you lose your atmosphere, that's a really big problem. But we don't know if a lot of flaring is necessarily going to be a killer in every case. It's certainly possible to sustain magnetic fields on these planets that can deflect the flares' high-energy particles. When you have planets like GJ 1132b, it affords you the opportunity to finally start studying these kinds of effects in details. It's an uninhabitable planet, but it is giving us the opportunity to test some of our models about what is happening in the habitable zone around red dwarfs. Z.B-T.: Absolutely. The question, "Does a habitable-zone planet around a red dwarf have an atmosphere?" is open. That's one of the things that's most exciting to me about GJ 1132b. If it has been able to hold on to its atmosphere in so harsh an environment so close-in to one of these red dwarf stars, then that would certainly bode very well for a cooler, more Earth-like planet farther out to have an atmosphere as well. TKF: Will GJ 1132b help us understand how otherwise habitable exoplanets can become tidally locked to red dwarf stars, in the same way our Moon always shows the same face to Earth? Tidal locking to a star, according to some studies Rory and others have done, might be disastrous for alien life on an exoplanet. One side of the world would roast in a constant daytime, while its other hemisphere would freeze solid in perpetual night. Z.B-T.: I think it's going to be tricky to measure if GJ 1132b is tidally locked. If the planet doesn't have an atmosphere, you could look at the heat the planet emits as it rotates on its axis from our perspective, and you might be able to tell if there is a permanent daytime and a permanent nighttime. But this measurement would require a deep understanding of the planet's surface rock properties and would be even trickier if there is an atmosphere. So, I don’t know! But I'm certainly interested in the theoretical implications for GJ 1132b's atmosphere, and by saying so I will pass the baton to Rory. R.B. : It's really hard to imagine how GJ 1132b isn't tidally locked. When you have a planet that's so close into its star on just a one or two-day orbital period — a "year" on GJ 1132b lasts 1.6 Earth days! — it can tidally lock within just tens or hundreds of thousands of years. So the question is then, "how do you observe this effect?" Zach gave you a very nice explanation for one possibility that might work if there isn't an atmosphere. But my suspicion is that GJ 1132b will have an atmosphere pretty much no matter what. Because it's so close to its star, starlight is going to be melting rocks on its surface, which is going to produce a bit of an atmosphere. And if there is any sort of tidal heating in the planet, like what happens on Io, then it's going to be intensely volcanic. Of course, the atmosphere can be stripped away. You can eventually reach a point where there's just no other kind of element that can evaporate, so you'd end up with a naked ball of rock. At any rate, once we can get something like the James Webb Space Telescope to look at GJ 1132b, that'll at least get us down the road of actually trying to interpret the effects of red dwarfs on their exoplanets. The MEarth South telescope array at the Cerro Tololo Inter-American Observatory in Chile. Each telescope monitors its own set of nearby red dwarfs for exoplanet transits. TKF: Are there likely even better exoplanets in our cosmic neighborhood to target with the James Webb Space Telescope, or is GJ 1132b about as good as we can hope for? Z.B-T.: There are on the order of about 400 to 500 star systems closer than GJ 1132, but out of the billions of stars in the galaxy, that's a relatively small number! Because almost every star has planets, there are definitely planets that are closer than GJ 1132b. So far, though, we only know of two closer planets that transit their stars, but these exoplanets are not as small and cool in temperature as GJ 1132b. Based on what we know about the statistics of planets around stars, there should be something like 10 to 20 transiting planets closer than GJ 1132b. There's a mission being launched in 2017 called TESS — the Transiting Exoplanet Survey Satellite — that's going to go out and try to find those very nearby transiting planets. On top of that, we're also still looking for other planets in the GJ 1132 system. One of the things we've learned in the past couple of years is that multiple planet systems are very common around small stars like this one. We're looking with MEarth, the telescopes we already have observing the star. And we just found out we were awarded time with the Spitzer Space Telescope to stare at the star for four days straight to see if we can detect any transits of much smaller planets. GJ 1132b is probably about the smallest planet we could have possibly detected with the data that we have gathered so far. But if we push a little bit deeper, it could be that there are smaller planets lurking in nearby orbits that we could pick up very soon. TKF: You're all in relatively early portions of your careers. What does it feel like to have all these exoplanet discoveries happening right now? Z.B-T.: The most exciting thing to me is thinking about what the decades to come will hold for GJ 1132b . . . to be able to imagine what the telescopes that we're building right now will see when we look at it, and even the telescopes that will come after. It's really inspiring to think about the future discoveries that our students will make, or our students' students will make. R.B. : This is obviously exciting times to be an astronomer studying exoplanets. I have been studying them now for about 15 years, so I've witnessed a lot of the growth of the field. When I was a graduate student, it was unfathomable to me that we'd be sitting here talking about Earth-like, Earth-sized planets in our solar neighborhood, and yet here we are. In just a few years, we're going to be launching TESS and James Webb and we're actually going to be finding potentially habitable planets and characterizing their atmospheres. We're going to finally start answering some of these questions that have plagued mankind for millennia about whether are we alone and how common are planets. It's almost mindboggling to me that it's really where we're at! E.N. : As Rory mentioned before, exoplanets have been offering up surprises since we first started finding them. So I have a hard time imagining what the future will bring. Will there be life on other planets? I'm pretty pessimistic; I don't know if we'll find that. But the opportunities are finally coming, and I'm really just beginning my career. There's so much room over the coming decades to develop new techniques and new instruments that I think the possibilities really are endless."